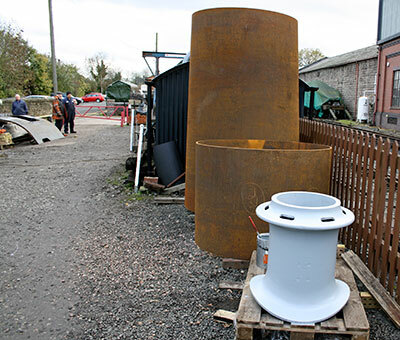 Preparations have been made for swaging the ends of the taper boiler barrel truly circular when space and staff become available in the boiler shop. Once this job has been done the shorter circular barrel section can be fitted into the small end of the taper section and the two riveted together. Outdoor work has focused mainly on the cab in recent weeks. Various holes have been drilled in the sides which will eventually be used for attaching various items inside the cab as the build progresses further. There is a bulkhead behind the driver’s seat and a smaller one behind the fireman’s seat which have been assembled and fitted to the main structure. Convex strip has been formed into square frames which will be attached as a surround to the side window openings and the sliding vent in the roof has occupied some time also. Once the construction is completed it is anticipated that painting will be done whilst the structure is still in kit form in order that paint can be got into the more awkward corners and recesses. The work on the cab has meant that nothing has been done on the smokebox in recent weeks apart from completing machining of the dart and fitting the handles on to it. Work on fitting the door etc. will be returned to in due course. Another aspect of the build that has received occasional attention is the vacuum and train heating pipework at the front end of the loco. These pipes run from the front buffer beam underneath the smokebox saddle before diverting towards the outside of the main frame. It was felt that access to install these pipes with the front pony truck in situ would be extremely difficult which is why that section has been attended to now. In the machine shop the majority of the driving wheel axleboxes have had the whitemetalled surfaces machined and the fit of the under keeps checked. Attention will soon turn to welding the manganese liners into place on the horn faces. 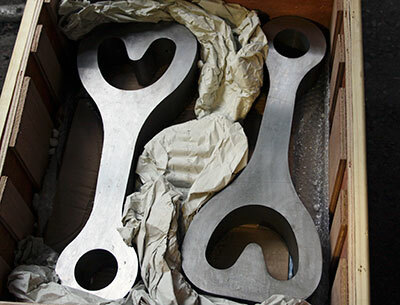 We have just taken delivery of the swing links for the suspension arrangement of the rear pony truck. Grateful thanks are extended to the Standard 2 project at the Bluebell Railway for masterminding this job and the casting of the top frame which we have but awaits machining. 82045’s pony wheels are at Buckfastleigh awaiting their turn in the work’s programme for fitting of axles and tyres. Front and rear cylinder end covers have been cast and await machining. Front steam chest end covers are about to be cast at the time of writing with pattern making in progress on the rear steam chest end covers. Casting of the expansion link brackets is programmed. A special train, with GWR Autotank 1450 plus recently out shopped GWR stock, is being run by the 82045 Steam Locomotive Trust to help raise funds towards components for the final large piece of kit, the Motion. The Motion has received some very welcome and generous donations from supporters, so we just need to make one final effort to help complete the job. The special departs Bridgnorth, where we have a welcome desk and the Buffet is open for breakfasts, before a non stop run to Highley. After a run round at Highley, the journey continues to Eardington Station for an extended stop and some organized 'jollies' including a historical tour of the site. The special then returns to Bridgnorth where shed visits have been arranged. Fares: £19.65 ordinary or £24.65 to enter the draw for one of four footplate rides on 1450. Cheques, made payable to the 82045 Steam Locomotive Trust together with a sae to: Bryan Clarke Oak Tree House, 10A Love Lane, Bridgnorth, Shropshire, WV16 4HD. We still have a few 2016 Calendars available - just time for that last minute gift! Details on our sales page. The chimney and boiler barrels in the foreground, with the cab roof to the left of the picture. Photo: Tony Massau. Two swing links for the rear pony truck suspension arrangement. Photo: Tony Massau. Well, here we are again at the end of another year in the life of the 82045 project. With just a few days to go to the Solstice, it seems a good time to bring you up to date with progress over the past twelve months. As usual, I have had a look back at the notes I wrote a year ago, and again I'm happy to say that they did not contain too many false predictions. The year started with the arrival at Bridgnorth of the cylinders from Teesside Components. These were successfully hydraulically tested by our working gang, though one cylinder did have to go back briefly to the North East for a minor problem to be rectified. That apart, the job was a good one, and both cylinders were soon in situ on the frames. The cylinders were quickly followed by the arrival from Boston Lodge of the bunker, which immediately attracted the attention of the enthusiast public. Painters Andy Williams and Gary Townley had done a superb job, though neither of them was entirely satisfied with it. It looked pretty good to me - and to everyone else - but I suppose a pair of perfectionists and craftsmen are inevitably going to be hard to please! Both cylinders and bunker were on public display for the Spring Gala, and it was noticeable that miscellaneous donations over the weekend were hugely up on previous years, a trend which was continued, indeed exceeded, in September, when our total revenue over the Gala weekend was more than £7,000. That leads me on to the subject of finances, and in particular of the Boiler Appeal. This had cleared well over £200,000 by the late autumn, and though the first inroads have started to be made into the account, I’m glad to say that it remains in a healthy state. As I think I wrote once, I had never understood the meaning of the old saying that the whole is greater than the sum of its parts until I became involved in 82045. I certainly do now: the collective energy, generosity and goodwill on the part of so many people has built up into a great groundswell of support such that we could never have anticipated in the early days, and this is what is carrying the 82045 Project towards a successful conclusion. Thank you all - 82045 would be nowhere without you! The ashpan has been fabricated and is ready to be fitted when the time is right. So, as you will see, there’s a lot going on, and prospects for 2016 look exciting. Fingers crossed all round that as much as possible goes to plan: if it does, we should be looking at an impressive piece of kit by this time next year! Before I wrap up, there’s just one small personal note I’d like to add. A recent issue of one of the hobby magazines contained an article which appeared to conflate the 82045 project with the embryonic scheme to build a new Fowler Class 4P 2-6-4 tank, the common link being myself. I would like to state that this did not come from me; that it was probably down to a journalist rushing to meet his deadline and getting his wires crossed; and that there is absolutely no connection between the two projects, with or without me. God willing, I shall continue to be involved with 82045 until I'm in my dotage (or in my box, whichever is the sooner), certainly long after your engine enters service - the job won't end there! adeste fideles et semper floreatis! Very best wishes to you all for Christmas and the New Year.